The year was 1995. Orey, being influenced by metal and inspired by Russian Paganism, began composing his own original lyrics and musical arrangements. And so, Pagan Reign was born. Orey created all the riffs and melodies by himself and later included them in the first album. For a long time he searched not only for talented musicians, but for musicians that held the same views as himself. In 1998, after a long search, along came Sloven, Pagan Reigns new drummer. In 1999, guitarist, Vetrodar, had joined the band. Together, the three devoted themselves to the composing of new songs and arrangement of new material. Their energy and potential quickly captured the attention of bassist Koldum, who soon joined the band. Then, despite unfavorable circumstances, the band began work on their first demo. The demo, titled �The Dawn�, was recorded during a repetition session and consisted of five tracks. After the recording was completed, Pagan Reign performed their first concert. Not only was their music stylistically unique, but their appearance also made people take notice. The musicians wore traditional Slavic clothes which made them stand out amongst other bands. Pagan Reign had taken part in all of the shows that were held in the clubs of Tver. By the end of 1999, they had finished recording their first full-length demo album, which was called �Ancient Warriors.� Because it was recorded at their home studio, the production left much to be desired, thus the demo wasn�t distributed amongst magazines and record labels. In 2001, the band decided to hit the studio (Music Terror Records) to again record the Ancient Warriors demo. The newly revised demo also included one new track, �Pagan Reign�, and was distributed as a promo CD to magazines and record labels. This distribution resulted in the inclusion of their track, �Death Is a Gift of the Gods�, into the black metal collection CD �Hellfire-5�. Another track, �Dawn� was played on the air in the radio-program �The Iron Curtain�. The band soon gained recognition and as a result, they played live at a pagan-metal festival in Moscow (Pagan Russia) on February 8th, 2002. This is also the year they added a fifth member to the band, keyboardist, Svyat. In May 2002, the line-up of these five musicians (Orey - guitar, vocals; Vetrodar - lead guitar; Koldun - bass; Sloven - drums; Svyat - keyboards) entered CDM Records Studio in Moscow to record a brand new album titled �Spark of Glory and Revival of Ancient Greatness�. The music of this album differed completely from that of their previous album because of the diversity of the compositions and the emphasis of Slavic melodies. Shortly after recording of the album, the band signed a contract with Sound Age Production, who distributed their CDs in Russia , Belorus and Ukraine . The band then went on tour performing several concerts in Moscow and Tver. In August 2003, Pagan Reign took part in Metal Heads Mission Fest in Eupathoria ( Crimea , Ukraine ). Then they played in Nizhni Novgorod, Moscow , Tver, and St.Petersburg. During the tour the keyboard player, Svyat, left Pagan Reign and was replaced by Gromoslav. In December 2003 Pagan Reign started to record their third album, �Destinies of the Bygone Faith�. A more professional studio, DAY Records, was the studio of choice for this album. In February 2004, the mixing and mastering of the album was completed. This time, the music changed direction as autumn changes to winter. The album is much harder than the previous one, while still maintaining the Slavic melodies and musical variety that has become signature to the band�s sound. Once again, Sound Age Production did a commendable job at distributing the new creation of the band. After recording their third album, Pagan Reign began to re-master and update their promo-CD �Ancient Warriors. Sound Age Production released this album in November of 2004. 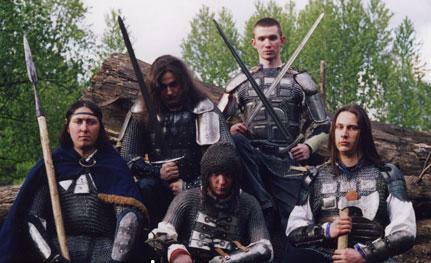 In 2005 Pagan Reign created a real masterpiece of slavonic pagan music taking its inspiration from the depth of history - album "Ancient Fortress". Proud sounds, born from crystal clearness of the native pagan world outlook, drums pounding and mighty guitar riffs, are rising to the realm of celestial Svarog, intertwining with winds of brass and rays of stringed folk instruments. Heavy guitar parts are beautifully expanded by pipes, flutes, reeds, domra, mandoline and authentic percussion instruments. The main theme of the album is the Ancient Pagan Fortress, or "Tverd" in old slavonic language, as a material Stronghold of slavonic spirit and invincible firmness of people who not only successfully resisted continuous aggression of nomadic hordes from the South-East and teutonic tribes from the North-West, but also managed to create its great realm called Rus'. The Spirit evoked in previous albums is also continued, with the musicians displaying their deep regard for their nation, history and native slavonic beliefs. Unprecedented solidity and clearness of sound is provided by a joint input of the band and producer Evgeni Vinogradov of "Dai Records", making this album highly qualitative and professional. Recording took place from January to May 2005. Official release date in Russia was June 2006.